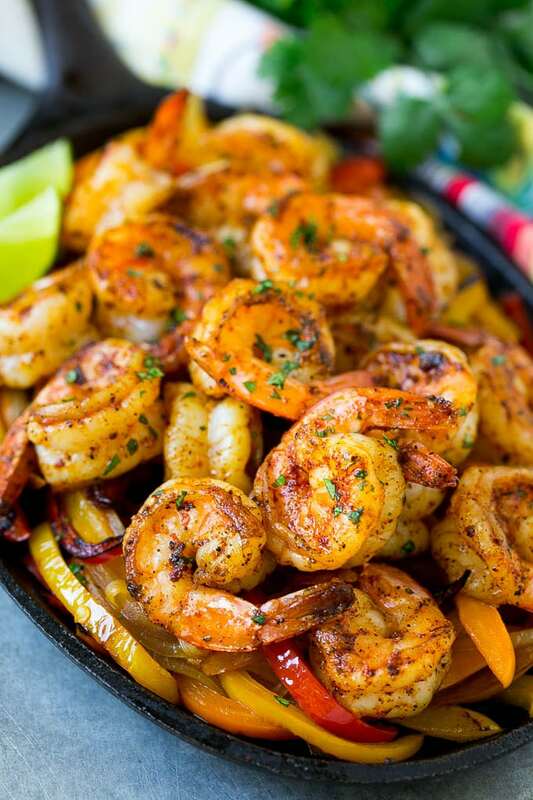 These shrimp fajitas are tender Mexican seasoned shrimp cooked in a skillet with plenty of peppers and onions. An easy dinner that’s just as good as what you’d get at a restaurant! Whenever we head to a Mexican restaurant, I always order the shrimp fajitas. I just can’t resist that sizzling platter of shrimp and veggies. Now you can have that same Mexican shrimp in the comfort of your own home! There’s nothing better than a delicious shrimp dish to commemorate warmer weather. That’s why I just had to make these shrimp fajitas. 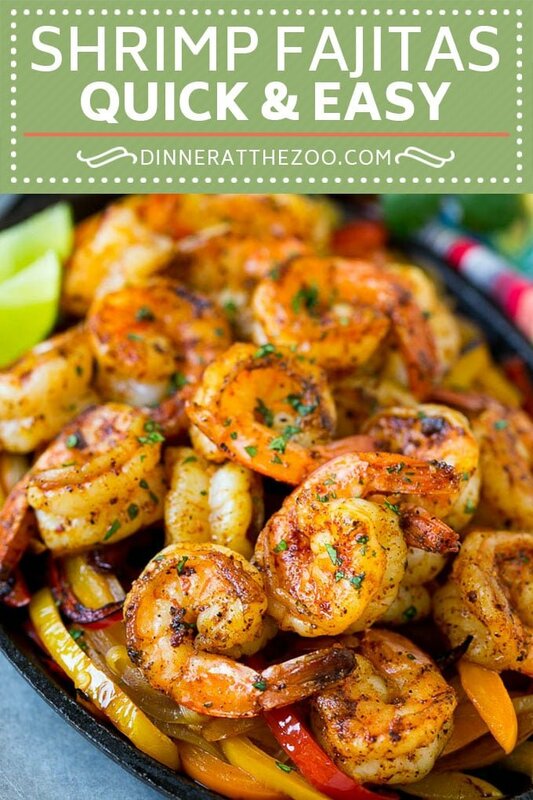 Tender shrimp cooked to perfection with all the flavors of your favorite Mexican restaurant dish. How Do You Make Shrimp Fajitas? These Mexican shrimp take just minutes to make and are packed with flavor. 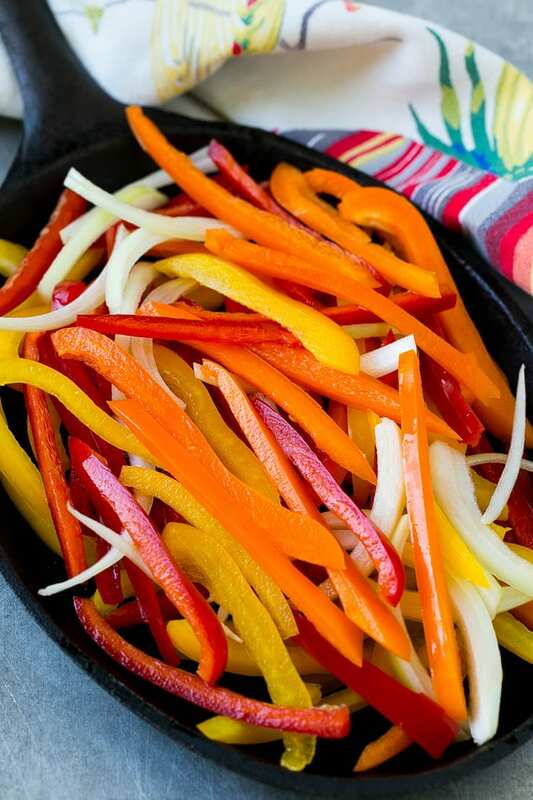 Fresh slices of onion and bell pepper are sauteed to perfection before being combined with plump, juicy shrimp. A delicious blend of spices are then mixed and sprinkled over the entire dish as it cooks. 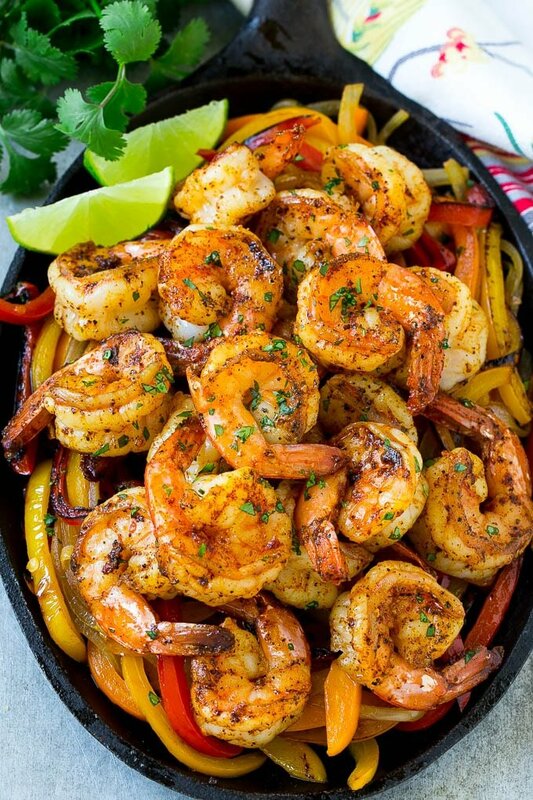 You definitely want to use the biggest shrimp you can find for your skillet fajitas. It’s up to you whether or not the tails are removed. I like to leave them on for a nicer presentation, but not everyone enjoys the extra step when eating the dish. How Do You Cook Shrimp Fajitas in the Oven? If you prefer cooking your Mexican fajitas in the oven, it’s definitely doable. All you have to do is skip the skillet and use a sheet pan instead. You’ll want to mix all the ingredients together that you would have used for the skillet fajitas and spread it across a sheet pan and bake until done. How Do You Know Shrimp is Cooked? Despite the type of shrimp you buy, you’ll want to make sure your shrimp is cooked properly for safety’s sake. All shrimp should appear pink with red tails. They should appear slightly white as well but too much white means you’ve overcooked your shrimp. It will be impossible to stay away from making these shrimp fajitas. They’re so easy and quick, and not to mention delicious, that I have no doubt I’ll be getting requests for them all year round. I’m not complaining, I love them and so does the family! 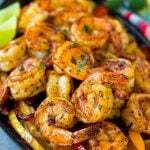 These shrimp fajitas are tender Mexican seasoned shrimp cooked in a skillet with plenty of peppers and onions. An easy dinner that's just as good as what you'd get at a restaurant! Heat the oil in a large pan over high heat. Add the peppers and onion to the pan and cook, stirring occasionally, until vegetables are tender and charred on the edges. Season the vegetables with salt and pepper. In a small bowl, mix together the chili powder, cumin, garlic powder, onion powder, smoked paprika, and salt and pepper to taste. Add the shrimp to the pan and sprinkle the seasoning blend over the shrimp and vegetables. Stir to combine. Cook for 4-5 minutes or until shrimp are pink and opaque. Sprinkle the cilantro over the top and serve. Garnish with lime wedges if desired. Serve the flour tortillas and toppings on the side and have everyone assemble their own fajitas. I just had chicken fajitas today but LOVE shrimp! I’m going to make this our Lenten dinner tomorrow night! Thanks! I just had a question about your calorie information. I would guess you are only counting the filling? A flour tortilla alone has over 150 calories. Yes I’m just counting the filling because the calories vary greatly between tortilla brands! I’m such a huge shrimp fan. I haven’t had a fajita in years. I’m totally going to try this! I’m ashamed to say I’ve never even made fajitas. It would be fun to make them in the summer when you can do it on the grill and not have all that heat and frying in the house. Looks delicious! I wish I could eat shrimp these photos look so tasty I could lick the screen! 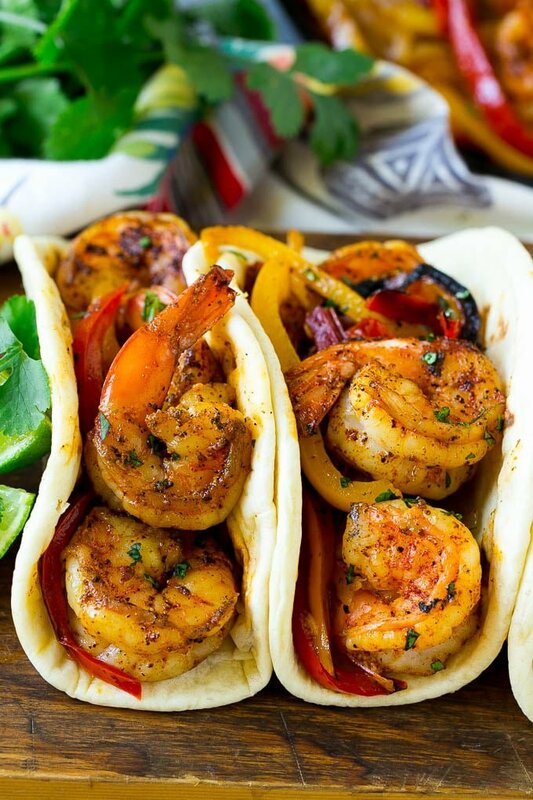 I am sending the recipe to my friend who LOVES shrimp and tacos…I mean this is like best of both worlds and fresh! All of my favorite foods! Fajitas are the perfect summer food. I’m always worried about overcooking and undercooking shrimp – your tips help! We love fajitas! Usually steak are my fav but will definitely need to try these! My family loves shrimp and I love all types of mexican food. I love how easy fajitas are to make. I SO love fajitas and they’re perfect with any kind of meat or seafood. I really like shrimp though, because it’s perfect for the season. I bet these taste amazing! These look so amazing. I’ve honestly never really tried shrimp, but this looks so good. I need to try it now because I’m sure these fajitas taste great with the shrimp. My husband loves shrimp and tacos. I bet he would go nuts for this. It looks so tasty. These look wonderful. We rarely do fajitas in our home but I definitely need to this summer! My daughters would really enjoy this addition to our weekly meal lineup. This looks incredible! I need to give these a try and mix up my meal plan! Andddd I AM DROOLING. THOSE LOOK SO FRIGGIN AMAZING holy moly! Cooked to perfection! I love fajitas! This shrimp version looks super tasty. 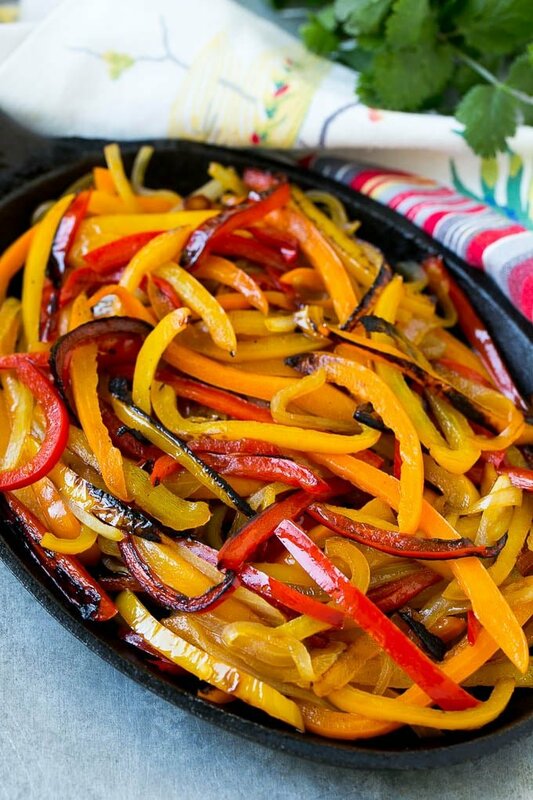 I love fajitas because you’re so easy to make and they are so healthy! I cannot wait to try this! It looks absolutely delicious.